Our baby boy clothes is 100% new and high quality. The boys outfit can be washed by hands and machine. 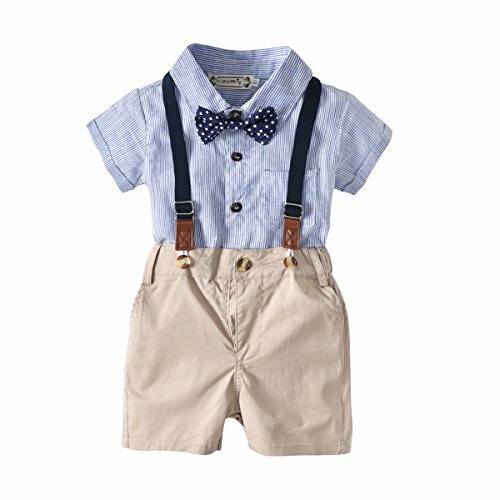 The gentleman design of blue striped shirt romper and khaki overlls shorts will make your baby boy super cool and handsome. The cute white dots dark blue bow tie matches well with the blue shirt, and it will make your baby adorable. The design of adjustable straps, elastic waist and buttons are easy for wearing and make your boy in a comfortable condition. The two straps could be took down. Perfect for formal and casual occasions, such as wedding, birthday party, photography, playwear, holiday, baby shower ect. The newborn boys romper set outfits is suitable for summer,autumn and spring. size95CM: Tops Length:21.26''(54cm), Bust/2:13.39''(34cm), Shoulder: 10.24'(26cm), Hipline: 13.78''(35cm), Shorts Length: 11.81''(30cm). Perfect for formal occasions,such as wedding,birthday party,photography etc. If you have any questions about this product by ALLAIBB, contact us by completing and submitting the form below. If you are looking for a specif part number, please include it with your message.